The pedestrian bridge connecting Music Hall and the Town Center Garage. "This pedestrian bridge is currently well beyond its useful lifecycle and presents a public safety risk," City Manager Harry Black wrote in a memo to the mayor and council members. "It is in a state of physical deterioration which makes it unusable in its current state." The city manager said the city has not made a decision regarding demolition of the structure. But he said there are three options: renovation, replacement or demolition. The memo does not list a cost for renovation. But it does note such a renovation "would only extend the life of the structure by less than a decade." Replacement is estimated between $3 and $4 million, but that money is not included in the Music Hall renovation budget. Demolition of the bridge that spans Central Parkway could cost between $600,000 and $700,000. "Stakeholders have been made aware of the city's intent to organize a working group to discuss what action(s) should be taken to main pedestrian access," Black wrote. "Through this coordination the city has worked to ensure transparency as the parties involved restore Music Hall and main a site that is so endeared to our community." The memo does suggest exploring "the use of an enhancement of the anticipated ticket surcharge to support infrastructure improvements for pedestrian access." 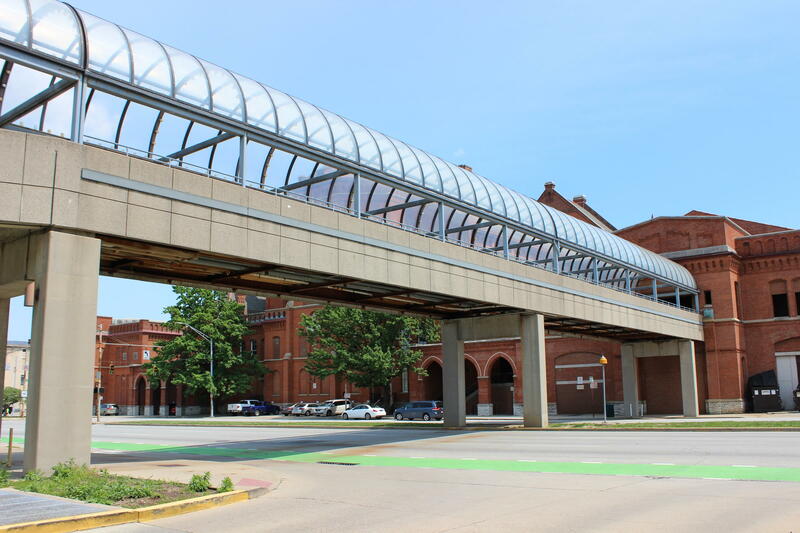 Last month, Music Hall architect Alan Weiskopf told the Cincinnati Historic Conservation Board that the renovation plan had been revised to maintain access to the Town Center Garage from a pedestrian bridge across Central Parkway. The entrance is planned to go through the Music Hall ballroom and would be ADA-accessible to Springer Auditorium. It is unclear how the city manager's memo affects the architect's plans.